The college application process is over, and you've accepted admission to a school. Congratulations! 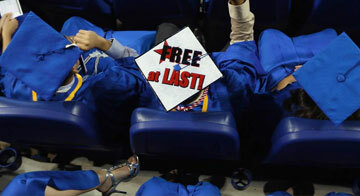 As graduation nears closer, though, don't let yourself catch the highly contagious "senioritis." Check out this article on the perils of senioritis. Slacking off at the end of senior year is very common, but it could derail your college future. 22% of colleges revoked an admissions offer in 2009, and that percentage is on the rise. Why was admission revoked? Poor final grades account for nearly 70% of all revocations. Even if a college doesn't revoke their admissions offer, there are potentially severe financial consequences to slacking off at the end of senior year. Many students take AP exams, and achieving scores at a certain level can result in transfer credit, which in turn saves money. Failing to work hard to pass AP exams could cost a student thousands of dollars. How are you avoiding the senioritis phenomenon? We would love to hear your comments below.